This past weekend, my wife and son and I went to see a movie that I'm comfortable saying I will never forget. And I don't say that about just any movie. 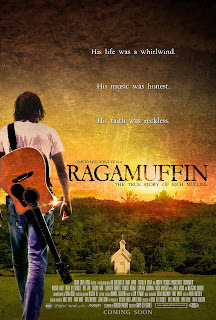 Ragamuffin is about one of those guys who left an indelible mark on the world, and then abruptly and unintentionally left it too soon. Rich Mullins wrote a song that by now, pretty close to anybody who's been in church more than about ten minutes is familiar with: "Awesome God". He wrote a bunch of other cool songs about Jesus, too. In fact, come to think of it, almost every song he wrote was about Jesus. In the 80s and 90s when Rich was around the music scene, there was a lot of pressure to do otherwise - his focus on vulnerability and seeking to honor only Christ in his music made quite an impact on the Contemporary Christian Music industry he was in. And that's part of what the movie is about, but it's about much, much more. Let me back up a little bit. Back when I was in high school I heard "Awesome God" on the radio, and instantly realized how unusual it was. These days, Christian radio is pretty much full of songs that you also find in church worship services, but back then it wasn't like that. Back then, if you were doing "contemporary worship" in your church, you were probably getting your material from one of several outfits that were putting out CDs specifically for that purpose... the Integrity Hosanna series, the Maranatha Praise series, that sort of thing. But this song was on the radio, and it sounded like a song you would do in church, complete with a full choir on the chorus! And yet, it was kind of subversive. Have you ever listened to the parts that aren't the chorus? By "Awesome" Rich Mullins clearly primarily meant "powerful", and the verses are about God displaying his power. Ever sing that line about how God poured out judgement and wrath on Sodom in your church? I didn't think so! Anyway, in the years following I enjoyed Rich's music very much, and I even bought a couple of his CDs, although I didn't try to snag every single one that came by. When I heard he was going to be playing a concert in Tulsa where I live, I jumped at the chance to attend! It was a terrific show, and I'm certainly glad I didn't play the "I don't have time, I'll catch Rich the next time he comes to town" card. Rich never came back to town. I few weeks later I heard the news that Rich had been killed in an automobile accident. Fast-forward to a month or two ago when I heard that this movie had been completed and was being shown literally a couple of miles from where I live! The only showing in the entire state of Oklahoma! My wife and I certainly weren't going to miss this! And I knew my son, who wasn't even born when Rich died but who has been a fan of his ever since he was old enough to be a fan of anything, would want to go too (he did). The movie had a profound effect on the three of us. I think it moved my son more than any other movie he's ever seen. On one strange level, it's the same old story of a rock star who shone brightly, attacked life and music with gusto, and left too soon. On another level, it's the story of a guy who struggled to understand his own life and his own place in God's plan, but who always always always trusted God. All through the movie you desperately want to see Rich find an escape from the tumultuous things in his life. In the end, he does find that place, in the "Sunday-school answer" he knew all along: Jesus' love is that place of peace. Rich had done interviews over the years, and I probably heard one or two of them, but most of what I knew about him was based on his music. Rich's songs are very tightly focused on Jesus and on God's love, but they also have a strong artistic sensibility about them. The lyrics are vivid, and (especially a bit later on) the musicianship and instrumentation are beautiful. This was clearly music created by someone who loved music very much, and who loved Jesus even more. What I didn't know about were some of the details that a guy doesn't really care to talk about much in interviews with Christian radio stations, such as the unsatisfying relationship he had his whole life with his father, getting put out to pasture by the love of his life who apparently couldn't bring herself to follow him into his blossoming music career, and his alcoholism and smoking. The movie doesn't shy away from any of those things, and it gives you a very layered look at the man behind all of those beautiful songs. But I think that you really have to be familiar with Rich's body of work to appreciate this movie for what it is. Rich's songs appear at many points during the narrative, but unless you have a firm sense of what Rich was trying to articulate in his music, what he truly believed with his whole heart, it would be easy to get a misguided idea of what the guy on the screen was really like. There aren't very many on-screen discussions of God; actually, there are a number of discussions that occur visibly, but narration sums up what they are about. The movie is about Rich's life; to find out about his beliefs you need to listen to his music. This is not a fault of the movie; this is what happens when you try to boil down 40 years of a complex man's life into a 2-hour movie. You hit the high points. And I think the move does a very satisfying job of giving us a bird's-eye view of the life of a very interesting human being. The movie is not perfect. Judging from photos and videos I've seen of Rich, I think he generally had a friendlier vibe personally than was portrayed in the film. I suspect that in the movie Rich comes off more Jim Morrisony than he did in real life. However, Michael Koch (who played Rich in the film) does an impressive job of channeling Rich's vocals and piano/guitar playing, and his acting performance is certainly compelling. The story rambles a bit; instead of being a very clear exploration of one aspect of Rich's life (such as "this is the love story about Rich" or "this is the story of how Rich's music was made") it touches on a lot of things. On the one hand, maybe a polished Hollywood guy would have tightened that up a bit; on the other hand, I think to some extent Rich rambled his way through life, and maybe that kind of script is just the thing. It did give me the impression that the movie was longer than it turns out it actually was. In the end, I am so glad I got the opportunity to see this movie. I would highly recommend it to anyone. I would go see it again in a heartbeat. If and when it comes out on DVD, I'll be picking up a copy. I've been listening to Rich's CDs all weekend, and now I see some dimensions of the lyrics that I didn't notice before (there are lines in "We Are Not As Strong As We Think We Are" and "Jacob and 2 Women", for example, that take on an added poignancy when you know about the Rich's love for a woman who turned her back on him). I won't ever hear Rich's songs with the same ears again. I do hope a lot of people see this movie and let God speak to them through it. If it's coming anywhere near your town, PLEASE go see it. You will definitely not regret it.